Reboot your computer daily for optimal performance and to clear cache. Also while rebooting unplug and replug in your router to ensure your internet has optimal performance. Yes this really does help i promise. Download the Internet Connectivity Monitor to ensure you have stable internet connectivity (internet loss can cause tick data to be missed therefore resulting in your charts not aligning.) Make sure it is always on. Just have it to connect to Google as they are always up, so it will be a great way to ensure whether or not you have a internet connection issue. It is absolutely vital is to make sure your clock is perfectly synced and set to Eastern Time. You can use a different time zone but then your changing a variable so that could make things look differently, (most programs like email etc.. you can set your local time zone in despite what your computer time zone is.) Also, its much harder to share charts and compare charts in various time zones. Change your computer to ET, clear your NinjaTrader cache and then close re-open NinjaTrader. Going forward, NinjaTrader will open in ET. If your clock is out of sync, that can make things different as bars/minutes can have different start and stop times by being out of whack on your clock. Often this is so negligible you can't even notice it. Even a second, sometimes milliseconds can make a big difference. No matter how accurate you think your computer is, EVERYONE no matter what should have clock sync on your computer. As a trader, you don't want your clock off by even a millisecond. It auto syncs every 15 minutes. The only 3 data feeds i use are AMP/CQG, FXCM, and IQFeed - as I have found they provide the fastest and most accurate unfiltered tick data. Always connect AMP/CQG, then FXCM, then IQFEED. 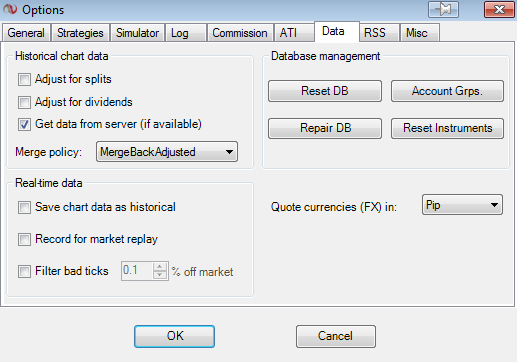 I don't use TOS, Interactive Brokers, Rhythmic etc..FOR MY NinjaTrader data feeds. You can use various feeds for say execution brokers but not as data feed (ie connect to data feeds we suggest then connect to broker after you have connected to data feed) If you use some other data feed then we will assume that is the reason your data feed is different than others. Notice Kinetick DOES NOT have ICE so you can't use it to trade TF. You are using tick data (ie on diagnostic bars or any bar type even on volume this can be impacted on minute bars as volume is tick based) so you MUST clearing your db/cache folder DAILY. Just a few ticks lost etc.. can mess up your chart buy a small amount. And sometimes a small amount is the difference between a win and a loss. So take the 3 seconds this takes and do it 1x a day first thing. Simply click on the toolkit and open it in your windows start menu or on your desktop and it will show you the date of the latest update. Go to Help > About in NinjaTrader and you will see the version at the top. To help license key and enter you key on the download page of NinjaTrader and you will see the latest available version. Today I tried to go to the trading room. I couldn't the screen told me to submit a ticket in reference to my account. Thank you for any help you can give me. i recently just purchased a new computer and sold my old one and ive downloaded apex toolkit 2 times already in which i still have it on 1 of the computers ..i had 2 computers and sold one... i recently just purchased the new voyager laptop from ez trading computers and needed to download tool kit but its saying i used the max usage ...how can obtain another download? If you are a paid subscriber, you can message the help desk and we can reset your machine count for you. You will get the "Too many machines" error message if you have reached your two machine limit and attempt to install the toolkit on a third machine. What is the Learning Management System? How do I use the Help Center/Knowledge Base and Community?